This is one of my favorite recipes by Tupperware and I make it often! If you have any nut allergies, you can omit the nuts. This is a great recipe to make for parties, family reunions, cookouts and BBQ's, etc. If you are looking for finger foods, this is a good one to try making. Although the recipe calls for either a yellow or carrot cake mix, I personally think it tastes better using the carrot cake mix. Preheat oven to 350 degrees F. Grease bottom and sides of rectangular pan or spray with cooking spray. Peel carrots and shred them using a hand grater. Using an electric mixer and a Saucy Silicone Spatula, blend cake mix, oil, eggs, crushed pineapple with juice, Simple Indulgence™ Cinnamon & Vanilla and water in a Thatsa® Bowl until well blended. Add the carrots and mix until the carrots are fully incorporated. Spread cake mix evenly into baking pan. Bake for 30-35 minutes or until toothpick inserted in center comes out clean. Cool completely. Spread prepared frosting over cake and sprinkle with Simple Indulgence™ Cinnamon & Vanilla and the optional nuts before serving. Slice cake into small pieces before serving. Cover the cake and store in the refrigerator. 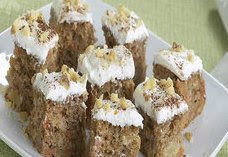 oh my gosh, i have to try this mini carrot cake recipe. it looks delish and super cute!! thanks for visiting us at thefoodaddicts.com!